After they were decommissioned by the Air Force thousands of the these simulators had coin slots attached to them and were redeployed outside of U.S. supermarkets along with race car and horsey simulators. 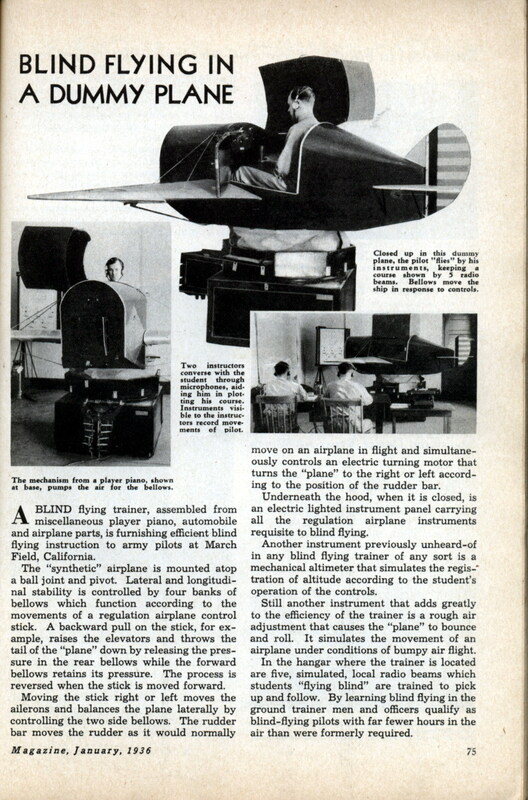 A BLIND flying trainer, assembled from miscellaneous player piano, automobile and airplane parts, is furnishing efficient blind flying instruction to army pilots at March Field, California. 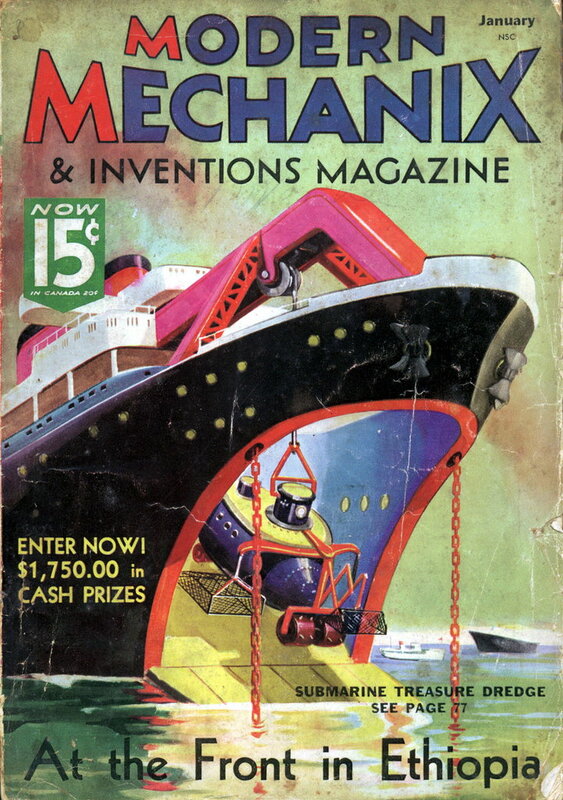 The “synthetic” airplane is mounted atop a ball joint and pivot. Lateral and longitudinal stability is controlled by four banks of bellows which function according to the movements of a regulation airplane control stick. A backward pull on the stick, for example, raises the elevators and throws the tail of the “plane” down by releasing the pressure in the rear bellows while the forward bellows retains its pressure. The process is reversed when the stick is moved forward. Moving the stick right or left moves the ailerons and balances the plane laterally by controlling the two side bellows. The rudder bar moves the rudder as it would normally move on an airplane in flight and simultaneously controls an electric turning motor that turns the “plane” to the right or left according to the position of the rudder bar. Underneath the hood, when it is closed, is an electric lighted instrument panel carrying all the regulation airplane instruments requisite to blind flying. Another instrument previously unheard-of in any blind flying trainer of any sort is a mechanical altimeter that simulates the regis-* tration of altitude according to the student’s operation of the controls. Still another instrument that adds greatly to the efficiency of the trainer is a rough air adjustment that causes the “plane” to bounce and roll. It simulates the movement of an airplane under conditions of bumpy air flight. In the hangar where the trainer is located are five, simulated, local radio beams which students “flying blind” are trained to pick up and follow. By learning blind flying in the ground trainer men and officers qualify as blind-flying pilots with far fewer hours in the air than were formerly required.